It's been a long, stressful school year. But by some miracle, it's finally OVER! And with the incredibly unbelievable news that I've been accepted to the UCLA School of Theater, Film, and Television, I can finally relax (it was only the reason I moved to California, yeah, no biggie). With that said, what better way to kick this summer off than with this mouth watering twist on my absolute favorite summer classic: s'mores. After these first few months of blogging, this is definitely my favorite recipe thus far. I hope you'll all give it a try! It's easier than you'd think, and the final product is so worth it. Begin by preheating your oven to 350 F and line a pan with foil, allowing it to hang about an inch over the edges (allows for easier removal once the brownies are baked). Lightly spray the foil with non-stick cooking spray. While the oven preheats, start on the graham cracker crust! In a bowl, combine the honey graham cracker crumbs (make your crumbs in a blender or food processor), 5 tbps of melted butter, 2 tbsp of brown sugar, a pinch of salt, and a sprinkle of cinnamon. Press the mixture evenly into the bottom of the pan, like you see above, and then bake the crust for about 20 minutes—until it turns golden brown. While the crust bakes, start on the brownie mix. Before this recipe, I had actually never made brownies from scratch (always used a boxed mix...oops)! It was SO simple, though. If you're like me and have never made homemade brownies, definitely give this recipe a try. It's surprisingly easy, super delicious, and so fun. To start on the brownie batter, get out a large, microwavable bowl. Into the bowl, pour ½ cup and 2 tbsp of water. Pop it into the microwave until it's boiling, about 1 and a half minutes. Remove the bowl carefully from the microwave, and whisk the cocoa powder into the water. Once you have the cocoa powder whisked in, add the semi-sweet chocolate chips and stir them until they melt completely. Into this chocolately mixture, add and mix in the melted butter and vegetable oil. Next, add the eggs and yolks, along with the vanilla extract. And then add in the white sugar, brown sugar, and salt. Whisk this in vigorously, until smooth. ...stirring with a spatula until the whole thing is combined. And then your brownie batter is done! Your crust should be out of the oven and slightly cooled by now. 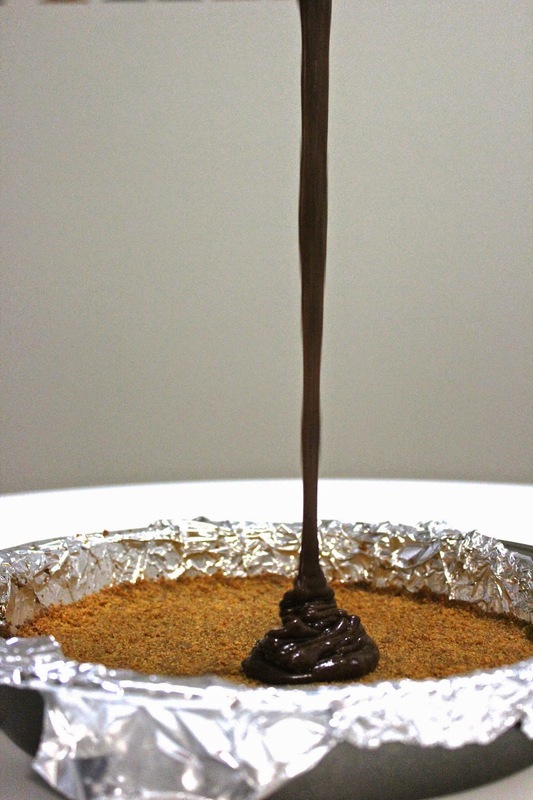 Once the brownie batter is ready, pour it evenly onto the crust. I forgot to take a picture of this next step, but it's pretty crucial to getting that traditional s'mores flavor! Before putting the pan into the oven, plop in a few (or a bunch) of Hershey’s milk chocolate pieces and allow them to sink into the batter. This adds little pockets of creamy melted chocolate throughout your brownies...crucial step people, crucial step. Once the Hershey's pieces sink in, pop the brownies into a 350 degree oven and bake them for about 30-35 minutes, or until a toothpick comes out fairly clean. (I always like to leave them a tiny bit uncooked, to ensure the brownies will be super fudgy). Yay! Look at dem brownies. After removing them from the oven, quickly cover with both mini and large marshmallows (that have been split in half). The large ones make the brownies look nice, while the small ones fill in any gaps. Turn the oven up to broil and place the brownies back in for about two minutes, or until the marshmallows are golden brown—watch closely to make sure they don’t burn! 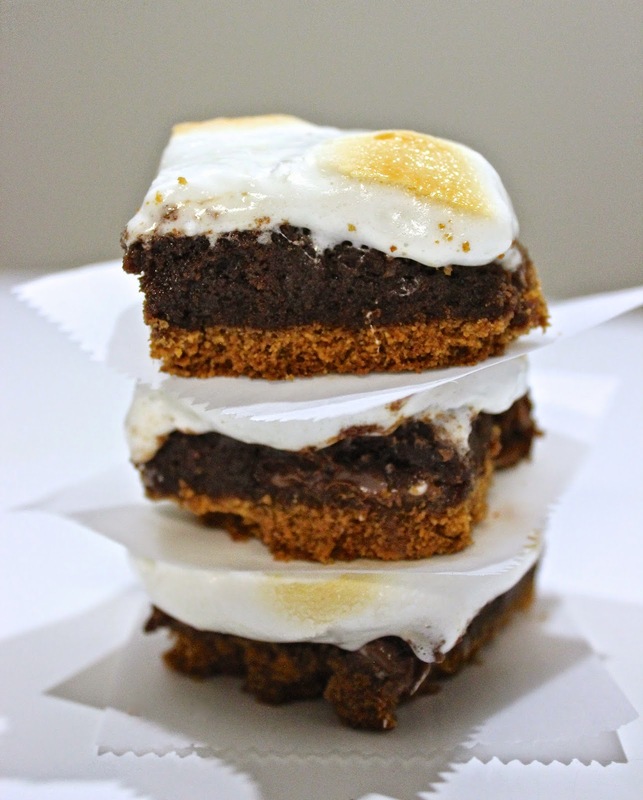 Once golden, remove your s'mores brownies from the oven, allow to cool, and enjoy! They store great in the fridge and taste just as good warmed up the next day. Just look at that. You can't resist that.